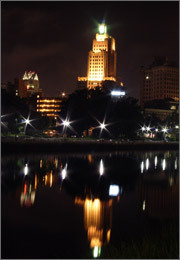 One of the first cities founded in the United States, the history of Providence embodies many of the fundamental principles inherent in America. Roger Williams founded Providence as a haven for religious dissidents escaping Massachusetts Bay—a colony itself created to avoid religious persecution in England. Providence grew from an agricultural center to an industrial powerhouse. Today it has reinvented itself a technological and financial center for southern New England. Providence lawyers can help you with any legal issue you may be facing, including divorce, personal injury, real estate, bankruptcy, criminal law, wills and trust, and many others. Attorneys in Providence are familiar with this court and Providence’s State District Court. Other courts in Providence include Family Court, County Superior Court, and Rhode Island’s court of last resort, the Supreme Court. Should your case ever go to trial, you will want a local Providence lawyer with experience in these courts. If you need an attorney in Providence, let LegalMatch find an experienced Providence lawyer for you. Instead of blindly searching through the phone book, LegalMatch.com’s unique attorney client matching service will match you with an outstanding local attorney well versed in your legal issue. LegalMatch.com has found successful Providence lawyers in your area, and we can bring them to you for free.